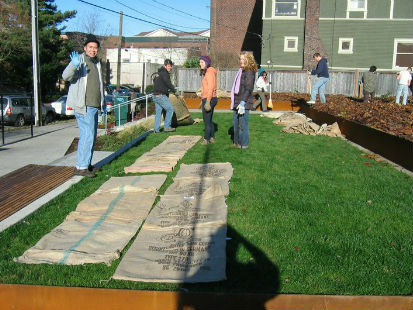 Over the last several years we've been proud to be involved in several projects both here in our own back yards and in yards and green spaces throughout the country. 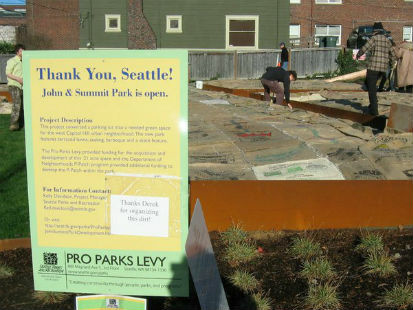 Here are a few projects we're proud to share with you. If you have a great project you'd like to share, please get in touch with us and we'll be sure to load your photos to both our website and facebook page! Contact us and let us know what you're up to. 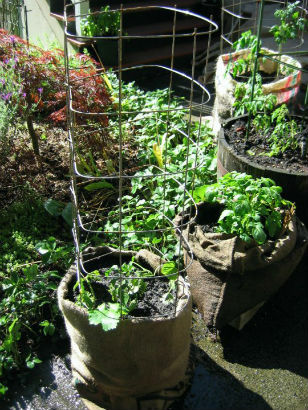 Using burlap bags as planters instead of expensive wine barrels or buckets is the way to go! 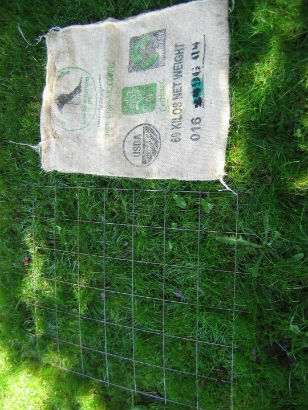 Needing only a small piece of wire mesh and a burlap bag, it's both simple and inexpensive to make. 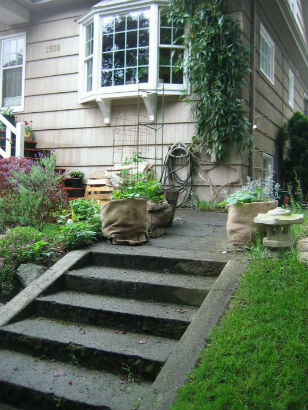 The nature of the bag allows the earth to "breathe" and it cannot be overwatered. 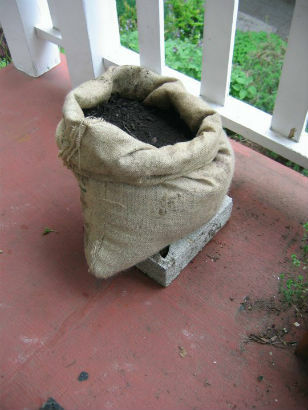 Rest the finished planter on a wooden pallet or cinder block to allow the bag some air. 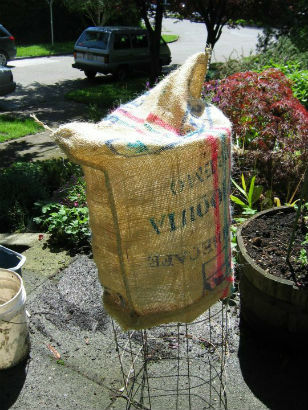 Start with wire mesh and a heavier burlap bag (sisel or blue-line jute bags) Building a wire trellis inside a burlap bag. Putting the bag on upside down helps. Fold down the sides for tighter hold and nicer look. 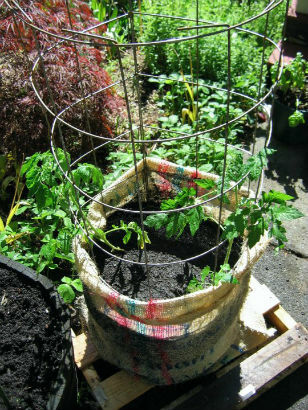 Fill it with soil and a plant and let the sun do some work! 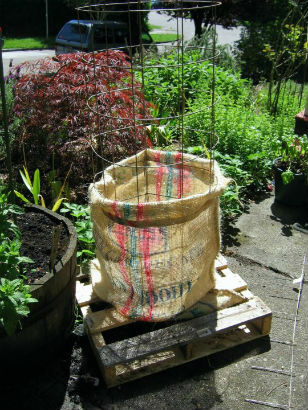 A bag container for potatoes. 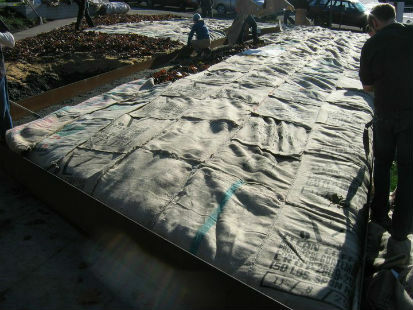 Resting on a cinder block for air-flow. 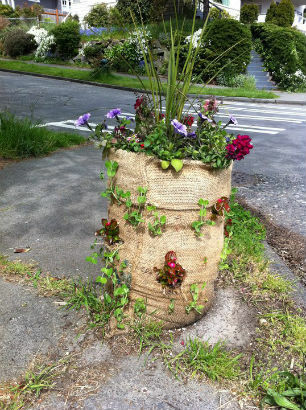 Using a burlap bag as a barrel planter. Flowers grow out of holes poked in the sides. 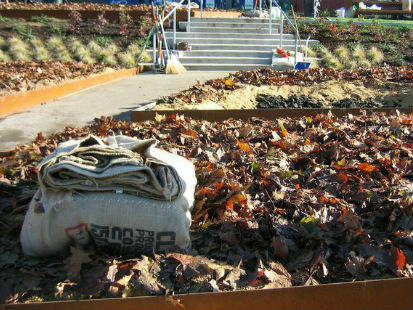 The first layer of earth retained with burlap filled with dirt. Second layer is done. 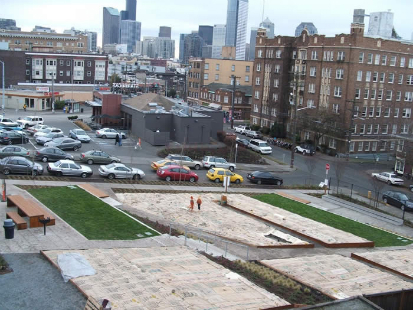 After some clean-up we're left with two usable beds. 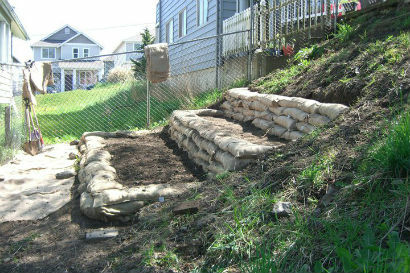 Turning this previously unusable hill into a place where a garden can grow. 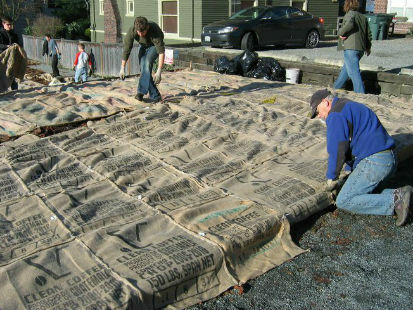 Instead of using a polypropelyn blended or plastic based fabric that will end up in the earth for the next 20 years, burlap is a great alternative. 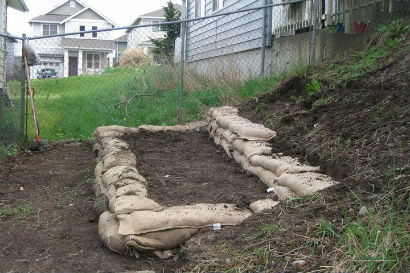 The burlap bags can be filled with a soil and stone/rock mixture to create that raised bed border that can still take plants. 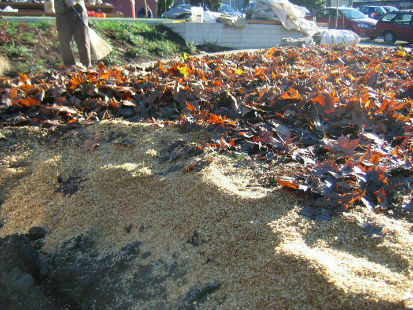 The benefit of using burlap is that it's a natural material that will hold up for enough time to let the restoration take root but then decompose into the ground. 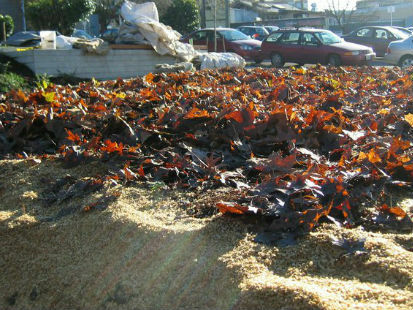 Thank you very much to Kaisha Eltrich for sharing her great work on this project. 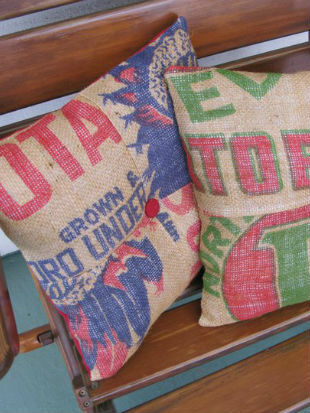 Upcycling burlap to create accessories and products is both environmentally and socially responsible. 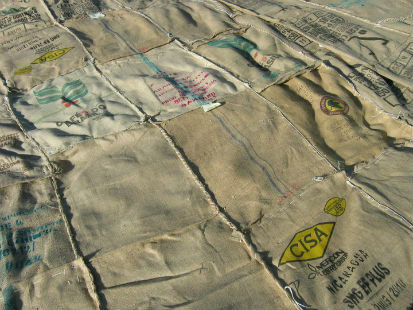 Not to mention the cost of material is low because it's a recycled material. 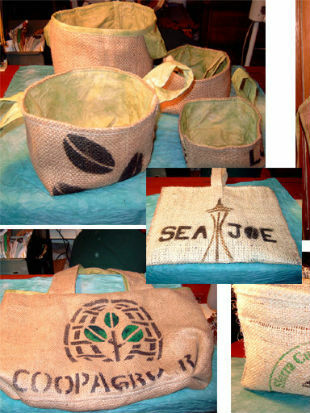 We have a significant number of very pretty burlap bags which can be reused for this purpose. 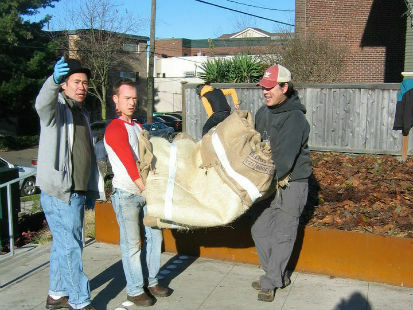 The artwork and quality of the bags are retained and we set these special bags aside primarily for this purpose. We have several different art bags available for your unique projects. Contact us and we'll shoot you images of our current selection of bags. 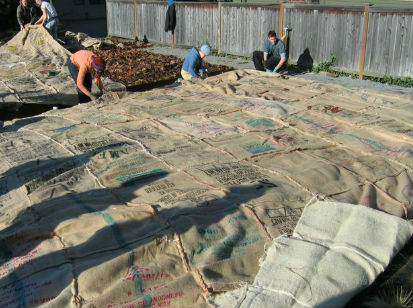 A great example of how to use burlap for both sheet multching as well as building a new p-patch. 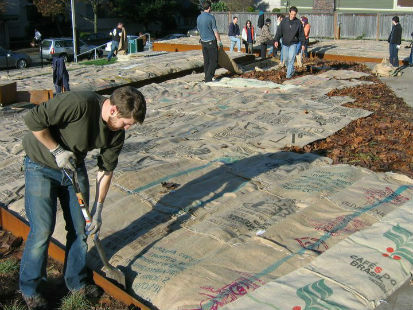 These are the projects we live for as it contributes both to community redevelopment of both the environment and to building neighborhoods.